Marketing director Jane Lim of Wee Hoe Cheng, a 65-year-old company that distributes food ingredients throughout Southeast Asia from its base in Singapore, said she was so moved by the stories and pictures of four U.S. dairy farmers that, “I felt my heart go out to them and their families as if I were on their farms." At the U.S. Dairy Business Conference in Singapore on Thursday, the mother-daughter business team joined more than 100 purchasing and marketing decision makers from throughout Southeast Asia. They gathered to learn about the advantages of importing U.S. dairy products and ingredients into their countries. 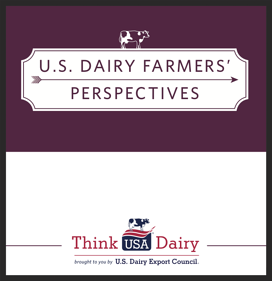 Several fact-filled presentations appealed logically to the head but it was the stories of the farmers that seemed to touch hearts, making the case to "Think USA Dairy." 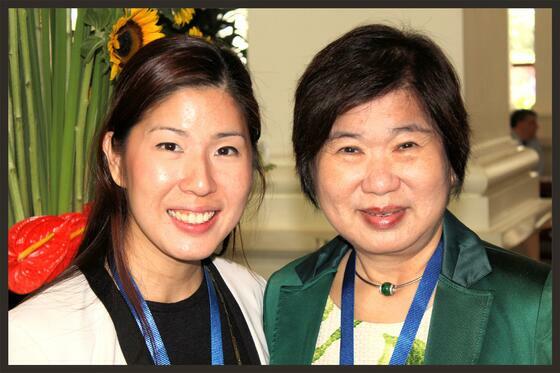 Singapore-based food distributors De Min Lim, left, and her mother, Jane Lim, said knowing U.S. farmers' first-person stories makes them more receptive to importing U.S. dairy products. Because milk from one out of seven tankers leaving American farms now ends up in dairy products and ingredients sold outside the United States, the U.S. Dairy Export Council takes four leading dairy farmers on an informational “mission” to a key overseas market every two years. This year's mission is to Southeast Asia, where U.S. dairy exports have more than tripled in five years, growing to $1.3 billion in 2014. The missions serve multiple purposes. The overseas trips show farmers, all Dairy Management Inc. board members, the growing need for dairy products in these markets and the opportunity for U.S. dairy exports. The farmers, in turn, take that message to DMI, their co-ops and other farmer networks, becoming enthusiastic evangelists for U.S. dairy exports. While overseas, U.S. farmers also serve as ambassadors for the industry by telling their stories of where and how the farm-to-table process of exporting U.S. dairy products begins. That's what happened Thursday at the two-day conference in Singapore. With a theme of "Family Farm Stories," each farmer told a three-minute, first-person story as photographis of their farms ran in slideshow-fashion on two large screens. Jane Lim said the family theme resonates in Southeast Asia because a "commitment to the future through the continuity of family is a very important value to us." WHC, co-owned by Jane Lim and her husband, is a family-oriented business with 30 employees, five of them family members. The farmer presentation kicked off with a video featuring USDEC and DMI chairman Paul Rovey on the Arizona farm his grandfather started. Each farmer then focused on an aspect of the industry’s commitment to overseas buyers. Here are their first-person stories and photo slideshows. Note: Slideshows are photo-intensive and may take a few seconds to load on some devices. I operate a 300-cow dairy in Idaho with the highest commitment to quality. The cooperative I ship to, Glanbia Foods, has nominated me five times for a milk quality award in Idaho. In 2013, I received the Quality Patron of the Year award, Glanbia’s highest honor. My commitment to milk quality traces back to a personal belief that any job worth doing is worth doing right. We do a number of things to achieve high-quality milk on our dairy. The animals are kept in outdoor lots with shade structures and windbreaks. We are in a relatively dry climate, but do get some wet spells. Regardless of the weather, we put fresh bedding down for the cows every day. The bedding should be clean enough that even I would feel comfortable laying on it. It’s all about keeping the cows clean and comfortable. A clean, comfortable, stress-free cow will produce high-quality milk. We also follow stringent sanitation standards in the milking parlor. The teat ends on the cows’ udders are sanitized before and after milking. Attention to detail is vitally important. We produce a wholesome product for the consumer—whether it’s my neighbor in Idaho or a child in Singapore. It’s very exciting to think that some of my product ends up overseas. My dairy cooperative ships cheese and dairy ingredients to countries all over the world, including Singapore and other Southeast Asia nations. It’s possible that some of the milk from my farm has ended up here at the conference. Besides high-quality milk, one of the things I like to emphasize is the care we give to calves. The calves receive recommended amounts of nutrients right after they are born, and the animals go on to receive excellent care throughout. Two years ago, my sons, Eric and Michael, decided to join me on the farm and we formed a partnership. I also have two daughters: Andrea and Jill, who are employed off the farm. My wife’s name is Barbara. A commitment to quality is what drives me, and it’s one of the things that distinguishes U.S. dairy products and makes them an outstanding buy for you, our international customers. My husband, Robert, and I farm in the beautiful rolling hills of eastern Washington State. Our mission over the years has been to provide high-quality milk and take good care of the animals. When visitors come to our farm, we are eager to show off the animals. They are good-looking cattle, with good conformation. Their udders look nice, their feet and legs are nice. They are content, laying down much of the time and chewing their cud. If you walk out to the lots, the cows walk up to you, want to sniff you—they are attentive and curious. We have several outdoor lots for the cows, but also a free-stall barn where the cows can lie down in stalls of their own choosing, and also get up and walk around for feed and water. We really love the animals. We know our cows—someone from the family milks them twice a day. A family member is there to attend every calving. All of the cows have names. Once I had a cow, Olivia. If I was in the parlor milking and called her name, she would work her way up to the front of the holding area, come into parlor and let me milk her. I enjoy sharing my story with customers. Some have called me a tireless advocate for the U.S. dairy industry. When I was first appointed to the board of Dairy Management Inc. in 2012, one of the things that excited me most was the chance to learn more about consumers and how I could reach them in a positive way for dairy. I have worked trade shows―I like doing that. I would like to expand my reach even more. This is true not only for customers in the United States but here in Southeast Asia. We need to understand our customers―what they want, what they need, how they feel about animal care, so they’ll continue buying our products. I would like to know more about the buying habits of young adults. In Southeast Asia, fitness drinks and other nutritional products are selling well among young people. An important component of these products is whey protein from dairy products. I want to know more about the importance of whey protein in their diets, especially as they strive to become more and more physically fit. The dairy cooperative my farm ships to has a strong commitment to exports. Our biggest opportunity for growth exists here in the Pacific Rim countries. Because we live in the Pacific Northwest, we have a sense that Asia isn’t that far away—indeed, it is the nearest continent to where we live and a long-time trading partner for many of our agricultural products, including dairy. My husband and I have four children. One daughter, Shenelle, helps on the farm. Two other daughters, Kira and Jocelyn, and our son, Burk, are employed out-of-state. Our family is committed to providing customers around the world with high-quality dairy products. I am proud of my dairy, located in one of the most productive agricultural regions in the world. I am especially proud to tell my story to dairy customers. The photos behind me show our beautiful farm. We are surrounded by pasture. The barns are beautiful. We built free-stall barns in before any of the other farms in the area. This is a popular barn style in the United States where cows can lie down in stalls of their own choosing, then get up and walk over to feed and water. Each time we built a new free-stall barn, we tried to install the latest, state-of-the-art equipment. We have done a lot of research into the best equipment, stall design and bedding for the cows. One thing we have always been is enterprising, finding creative ways to meet the needs of our cows and the needs our customers, which has allowed us to build our business. I’m an example of that. Here in California we get a lot of tourists, and one thing I’ve noticed is that they are interested in agriculture. For years, I helped out at the farm. Now, much of my time is spent at a winery and agri-tourism center that I operate with a business partner near Merced, Calif. It is located on Highway 140, a year-round gateway to Yosemite National Park, and includes an event center, a six-acre vineyard, winery, wine-tasting room and vegetable gardens. It is a popular venue for weddings. We have had visitors from 129 countries around the world. During the month of October, we have a fall festival that draws about 12,000 visitors, including 3,000 schoolchildren. There are nine learning centers for agriculture, including one for dairy. It is a great way to share agriculture’s story. It’s also helped me fine-tune my message about agriculture in general and dairy in particular, whether I am talking to someone at my winery or someone here at this conference. A lot of people see American farming as a major corporate endeavor. But, behind nearly every farm is a family and a face. Ninety-eight percent of the dairy farms in California are family-owned. My husband and I have five children. Our one daughter, Amanda, helps me at the winery. One son, Alex, helps manage the farm with my husband and me. Our oldest son, A.J., runs a dairy in Colorado and is helped by our youngest son, Aric. Another son, Anthony, works off the farm. My story hopefully conveys the sense of pride and enterprising spirit that characterizes so many dairy farms and processors in the United States today. Christina D. Karmadi is a key account manager, with the Indonesia division of TetraPak, a multinational food packaging and processing company. She came to the conference to explore options of shipping UHT milk from the United States to Indonesia and said she was struck by the images of U.S. farmers with clean barns, cared-for cows and hard-working farm families passionate about what they do. She was so impressed, in fact, that she inquired if there was a way she could secure dairy products made with milk from the four farms she had just seen. When asked what difference the farm imagery made to her decision-making process as a dairy importer, Karmadi said, "Seeing is believing."